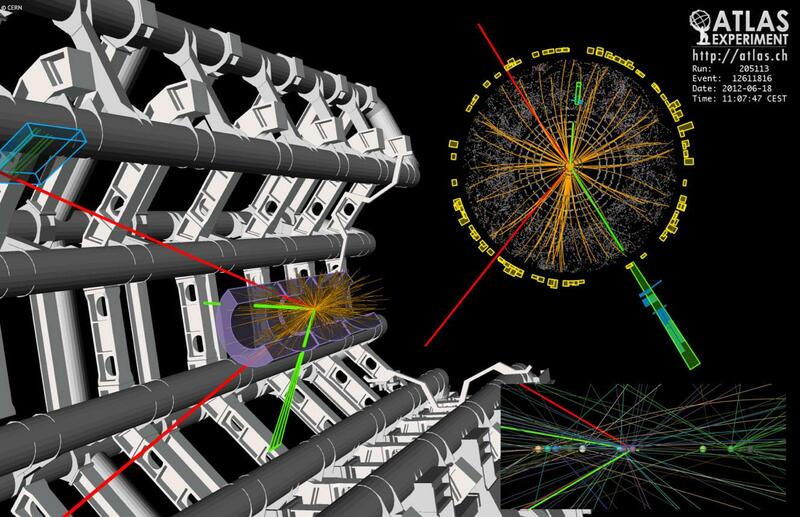 One of the main goals of the Large Hadron Collider is to look for signals beyond the Standard Model (the other major goal has already been fulfilled with the discovery of the Higgs boson). To this day scientists are still lacking clues. Could it be that signals for new physics are still hiding in the LHC data out of sight of the SUSY and Exotics searches performed to date? Did we really look at all relevant places? Adopting a more generic strategy allows searches for physics beyond the Standard Model without making assumptions on what such new physics signals might look like and that consequently minimise the probability of missing evidence of new physics. In other words, we can get a more “direct” look to the data in searching for hints of new physics that could answer some of the outstanding questions in particle physics. By adopting this approach, physicists hope to find hints of new physics that may be hiding in the data harvested from the current LHC runs. In a recent paper, a team of ATLAS researchers, presented a strategy that the ATLAS collaboration can adopt in generically searching for systematic and (quasi-)model independent deviations from the SM predictions. “This is the first LHC strategy for a model-independent analysis to search for physics beyond the Standard Model (BSM) in a structured, global and automated way.” says Sascha Caron, an ATLAS physicist from NIKHEF and Radboud University and a member of the analysis group. The goal is to identify phase-space regions where significant deviations from the SM predictions call for further detailed analysis; contrary to previous efforts that aimed to exhaustively measure the level of these deviations. According to Marina Rotaru, physicist at IFIN-HH and analysis team member: “The main advantage of this procedure is that it allows a large number of phase-space regions to be tested with the available resources, thereby minimizing the possibility of missing a signal for new physics”. It is not the first time that a similar approach is applied in high-energy physics. Previously, general search studies applied/used to analyse data by the H1 collaboration at HERA and by the D0 and CDF collaborations at Tevatron. Today, the data from these experiments have been well analysed and understood, they can serve to better tune a general strategy approach for the LHC experiments. “With no indication for physics beyond the Standard Model such an approach will ensure that deviations in the LHC datasets are not overlooked” says Simone Amoroso, physicist at DESY and co-author of the study. Searches for new physics at the LHC are based on testing (BSM) models and looking for deviations through many specific data sets or applying global fits searching for inconsistencies with the SM predictions. “Rather than letting theoretical models guide our searches, we make minimal assumptions and let the data tell us where we have to focus our next search efforts”, says Jeroen Schouwenberg, a physicist from NIKHEF and co-author of this study. This is not a trivial exercise! It requires a very good understanding of all Standard Model processes as well as the development of sophisticated tools for the statistical analysis; learning from what was applied in previous experiments. “To understand the complexity of the problem consider that in the current paper we have 704 final states (Fig.1) as a result of considering electrons, muons, b-tagged jets, non-b-tagged jets, photos and missing transverse momentum. We then break each final state down further as a function of an observable that better allows the detection of for instance a new particle (Fig.2). By doing that we end up with more than 300,000 different data selections that are being tested.” explained Jeroen. Fig.1:The number of events in data, and for the different SM background predictions considered, for classes with large ETmiss, one lepton and (b-)jets (no photons). The classes are labelled according to the multiplicity and type (e, μ, γ, j, b, ETmiss) of the reconstructed objects for the given event class. The hatched bands indicate the total uncertainty of the SM prediction. Fig.2: An upward fluctuation in the minv distribution of the 1e 1γ 2b 2j channel. The hatched band includes all systematic and statistical uncertainties from MC simulations. In the ratio plots the inner solid uncertainty band shows the statistical uncertainty from MC simulations, the middle solid band includes the experimental systematic uncertainty, and the hatched band includes the theoretical systematic uncertainty. In this strategy, high-pT events are selected and classified into different (exclusive) categories, labelled with the multiplicity of final-state objects. Typically, the analysis uses objects that are also used to characterize hadron collisions (i.e. electrons, muons, taus, jets, photons) while more complicated objects can be included. These final-state categories are then automatically analysed for deviations from the SM prediction in several BSM-sensitive distributions using an algorithm that locates the region of largest excess or deficit. It should be noted that the relevant SM processes are simulated with Monte Carlo event generators which is one of the points that can be further improved by adopting a better background model for future implementations. 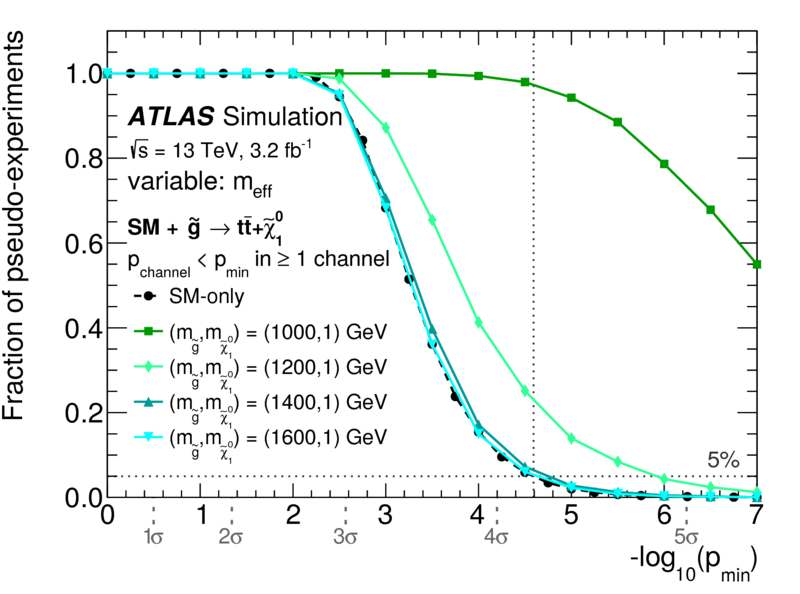 Moreover, sensitivity tests for specific signal models are performed to understand the effectiveness of this approach for the LHC experiments and specifically for ATLAS. Through a detailed analysis that lasted over two years, the team demonstrated that the new analysis could find unexpected signals for new physics, thanks to the larger phase-space regions probed that otherwise could remain uninvestigated. The method would trigger a more detailed analysis for areas where there is a deviation from the Standard Model. Moreover, this method is sensitive to smaller excesses that can occur when combining two or three independent data selections. The probability of a deviation occurring in any of the final states can be determined with pseudo-experiments, thus allowing a global interpretation of the probability of finding a new deviation with an experiment like ATLAS. 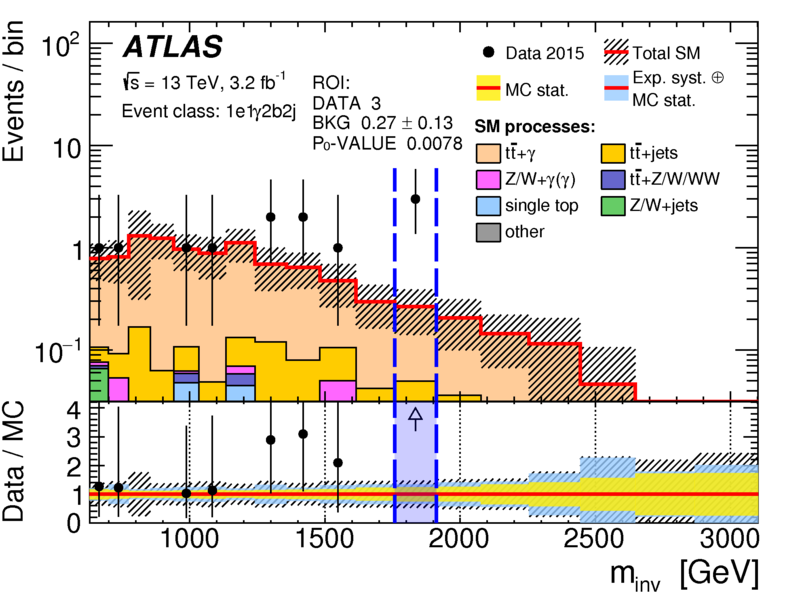 The strategy so far has been applied to the data collected by the ATLAS experiment during 2015, corresponding to 3.2 fb−1 at 13 TeV. Sensitivity studies with various benchmarks (tt¯ + γ, W Z, gluino, and Z’ production) have shown that the strategy could discover signals for new physics without an a priori knowledge of the existence of the processes. “With the new approach a gluino with a mass of 1.1 TeV could be discovered with a dataset of 10 fb-1 without any a priori assumption of the model, decay chain, cross- section or branching ratio and using a definition of significance which takes into account the many regions of the general search” explains Caron. This can be compared with a dedicated optimized search for gluinos in ATLAS which would discover gluinos up to 1.35 TeV with this dataset, but assuming that ATLAS would only look for this particular model (i.e. using a local definition of significance). Fig. 3: The fraction of pseudo-experiments in which a deviation is found with a pchannel-value smaller than a given pmin. Distributions are shown for pseudo-experiments generated from the SM expectation (circular markers), and after injecting signals of gluino pairs with g → tt̄+ꭓ10 decays and various masses. The line corresponding to the injection of a gluino with a mass of 1600 GeV overlap with the line obtained from the SM-only pseudo-experiments due to the small signal cross-section. A general strategy, could significantly help current searches for BSM physics and offers a fresh way to analyse current data from the LHC. It is true that since this strategy covers a very wide parameter space without narrowing it down to optimize for a specific class of BSM signals, it achieves a lower sensitivity compared to current dedicated searches and it does not provide any limits on BSM models. Further improvement of the method lies in the development of better algorithms – sensitive also to different types of signals – as well as identifying better observables. The first results of the new strategy were published in July. There was no significant deviation found and it didn’t call for a dedicated analysis using data-derived signal regions. However, this new approach proves to be useful in searching for signals of unknown particles and interactions in the subsequent Run 2 datasets, especial when combined with Machine Learning techniques. Who knows, maybe the next signal of new physics is will be found by an algorithm! The author would like to thank Simone Amoroso, Sascha Carron, Marina Rotaru and Jeroen Schouwenberg for their fruitful comments and remarks in the preparation of this article.